Storytime Studio – Open for Business! 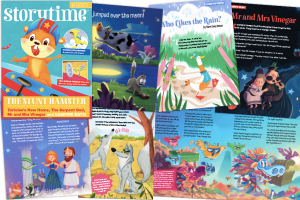 As well as creating the highly acclaimed Storytime magazine, our dedicated Storytime Studio team has over 25 years’ experience of developing original magazines and content for kids and adults. We’ve worked with big-name children’s brands (like Disney and Nickelodeon), start-ups, tourist attractions and international publishers. For an idea of what we can do for you, see the Teaching Resource and Activity Packs we recently created for Lee Valley Park Farms, or look at some of the best-selling magazines we’ve developed and worked on. Also check out our catalogue to see the work our talented team of designers, illustrators and writers produce for Storytime. See more of our portfolio at Luma Works, drop us a line: hello@storytimemagazine.com or call 020 7993 5583. “Thanks, Luma Works, for the creativity, passion and professionalism you bring to every project. You always rise to the challenge and invariably exceed expectations. Thanks, too, for being such a joy to work with.” Philippa Dawson, Developments, De Agostini. “The attention to detail is fantastic. Thank you very much for doing such an amazing job. It’s been great working with you. You’ve been so helpful.” Katie Wilson, Head of Marketing, The MAD Museum. “The content you have put together is absolutely first class. Our head of writing has been bowled over by the sheer depth and quality of your work. It was a pleasure to work with you.” Neil Maxwell-Keys, CEO, Digital Sea. NEW! Storytime’s Short Story Critique Service: Struggling to get your children’s short story in shape? For a one-off fee of £45 (for short stories of up to 1,500 words), the Storytime team will read your story and give you expert feedback on what works and what doesn’t work, plus ideas for improvement and valuable advice on the next steps you should take.